Lately, it seems that Greek winemakers have basically said, “Germany, you may take our social services, but you shall not take our grapes!” and have set out on a heavy marketing campaign for their wines. I’ve had Greek wines in the past so I would agree with what Jon Bonné says in that to a large extent, they do rival Italian and Spanish wines. It’s not to say that one is better than the other, but the Southern European countries are all producing quite wonderful wines and if you’re ignoring one for some reason, you’re just plain nuts and no, I won’t share what I’m drinking with you. But, it doesn’t stop there and if you follow even the slightest drops of wine news out there, you’ll see that the Greeks have managed to get a good swath of English languages articles about their wines as well as quite a blog buzz. At first I thought this was something along the lines of, “Oh… let’s toss the Greeks a bone and write up some sympathy articles because they really have it tough now…” But no, as Decanter states, they truly are exporting more of their wines. They’ve even managed to get the much sought-after Eric Asimov of the New York Times to write an article. I’m not particular fond of his “It’s not just the names of the grapes that may seem daunting…” quip as Mourvèdre and many other French or well-known grapes names are difficult to say as well, but his article is overall favorable. Still don’t believe me? Take a look at this article about wines in Santorini. 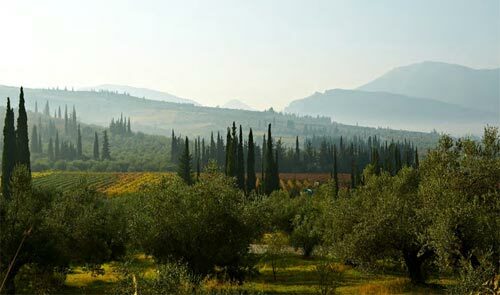 Or maybe this one about enjoying the wines of Crete and Greek Macedonia. Naturally, this sudden boom in textual content makes one wonder if there was some push for it to which the answer is yes, there was, shown by this author who also went to Crete and Santorini at the behest of several organizations. Naturally, it’s a treacherous road to walk if you’re completely relying on some press and the export market as it is as fickle as beach tourists, but hopefully this shot in the arm is enough to get their wineries going and normalized at least one part of Greece. Now it’s just a matter of convincing people about how good they really are.